Congratulations to Victor for finding the answer to part seven. Famed American author Ernest Hemingway (The Sun Also Rises, The Old Man and the Sea) lived on Dearborn Street in 1921. What does the city of Chicago have to do with famous actors/comedians Alan Arkin, Joan Rivers, Fred Willard, Peter Boyle, John Belushi, John Candy, Bill Murray, George Wendt, Mike Myers, Stephen Colbert, and Tina Fey? Same rules...you know the drill by now. Any newcomers to the competition? 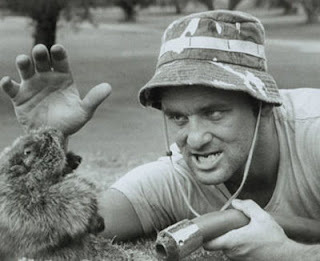 I'll let someone else answer this one, but I must say, I love the pic from Caddyshack. "Cinderella boy...former greenskeeper about to be come MASTERS champion! It's in the hole! It's in the Hole!" Wow. No takers on question 8 yet? Mrs. Barker gave a great hint! They were all members of the comedy troupe, Second City, I think.